Roman Polanski’s short film “A Therapy” offers up tantalizing Freudian readings for an unusual love triangle: a therapist, his patient, and her purple Prada coat. 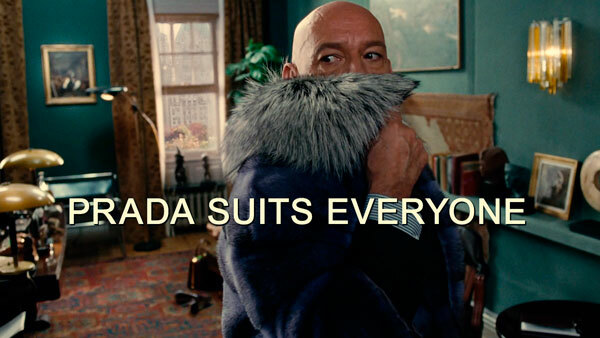 A traditional Freudian reading would regard the coat as a fetish object, its furriness begging for such a reading, though the purple might excite Freud more as it could possibly prevent the Prada coat from lapsing into cliché or becoming too damn literal (always a danger with Freud). The patient (Helena Bonham Carter) is perfectly cold and distant, does not even greet her therapist (Ben Kingsley) and certainly skips niceties. Her dream echoes this coldness. Her cold distance could in a Freudian reading imbue the coat, the fetish object, with more allure: a way to reach the unreachable woman. 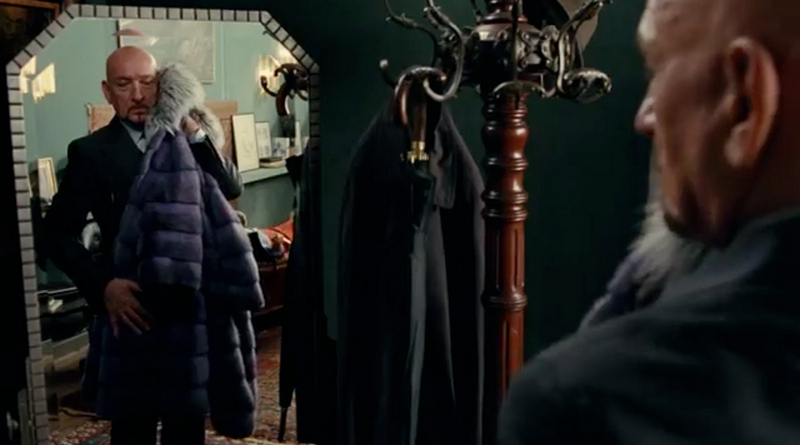 But most of this film rests on the therapist, his mad love, and the coat. In the mirror shot, it is just him, his reflection, and the gorgeous purple fur; this signals us that it is a love affair between him and the coat and the patient doesn’t really play into it. His ecstatic face tells us that too. But in case we miss that, the mise-en-scene tells us: the second he is drawn to the coat, the patient is no longer offered in the frame as a subject; she appears askew in shots or disappears from others. Except for one shot where we see her sideways and upside down, she exists as a disembodied, repetitive voice and a pair of legs on a therapy couch in the back of the shot. To be sure, the therapist’s love is a ridiculous love. Bittersweet, too: the sleeves are too short, but when he pulls the collar up and veils his mouth in the last shot we see how it highlights his beautiful eyes. And it probably can’t end well. Though he might go and buy his own. His ridiculousness is similar to the footballers intense love dance in Johan Renck’s “Pass This On.” But I don’t think I am alone in envying the therapist, feeling a little longing to be as ridiculous as him. “A Therapy” is the latest in a trend of art and commercials coming together in short film commercials. Several of these have been featured on Numero Cinq at the Movies: Ang Lee’s “The Chosen,” for BMW, Wong Kar Wai’s “There’s Only One Sun” for Philips LCD TV, and Lucrecia Martel’s “Muta” for MiuMiu. Rob, That’s a nice little essay on the film. Very elegant the way it moves along. And I love that Anne Carson book. And, yes, don’t we all envy that ridiculous passion.